Tomorrow is the seventh anniversary of an event that reflects an enduring national scandal. A long-running scandal that doesn’t trigger public or political outrage. I’ve written an opinion piece for the Guardian about this today. On May 31 2011 BBC’s Panorama exposed the abuse of people with learning disabilities at the NHS-funded Winterbourne View assessment and treatment unit (ATU) in Gloucestershire. There are around 1.5m learning disabled people in the UK, including my sister, Raana. But the general disinterest in learning disability means that tomorrow’s anniversary will not trouble the national consciousness. Rewind to 2011, and Winterbourne View seemed like a watershed moment. The promise that lessons would be learned was reflected in the government’s official report [pdf], and in its commitment to transfer the 3,500 people in similar institutions across England to community-based care by June 2014. Yet the deadline was missed, and the programme described by the then care minister Norman Lamb, as an “abject failure”. Since then, various reports and programmes have aimed to prevent another Winterbourne View. These include NHS England’s “transforming care” agenda, which developed new care reviews aimed at reducing ATU admissions. Yet despite welcome intentions, government figures [pdf] for the end of April 2018 reveal that 2,370 learning disabled or autistic people are still in such hospitals. While 130 people were discharged in April, 105 people were admitted. This month, an NHS investigation reflected how poor care contributes to the deaths of learning disabled people. It found that 28% die before they reach 50, compared to 5% of the general population. Unusually, this “world first” report commissioned by NHS England and carried out by Bristol University came without a launch, advance briefing or official comment. It was released on local election results day ahead of a bank holiday. Just before shadow social care minister Barbara Keeley asked in the Commons for a government statement about the report, health secretary Jeremy Hunt left the chamber. The most recent report was partly a response to the preventable death of 18-year-old Connor Sparrowhawk at a Southern Health NHS Foundation Trust ATU. The Justice for LB (“Laughing Boy” was a nickname) campaign fought relentlessly for accountability, sparking an inquiry into how Southern Health failed to properly investigate the deaths of more than 1,000 patients with learning disabilities or mental health problems. The trust was eventually fined a record £2m following the deaths of Sparrowhawk and another patient, Teresa Colvin. Recently, other families whose learning disabled relatives have died in state-funded care have launched campaigns, the families of Richard Handley, Danny Tozer and Oliver McGowan to name just three. Andy McCulloch, whose autistic daughter Colette McCulloch died in an NHS-funded private care home in 2016, has said of the Justice for Col campaign: “This is not just for Colette… we’ve come across so many other cases, so many people who’ve lost children, lost relatives”. Typically, the McCullochs are simultaneously fighting and grieving, and forced to crowdfund for legal representation (families do not get legal aid for inquests). To understand the rinse and repeat cycle means looking further back than 2011’s Winterbourne View. Next year will be 50 years since the 1969 Ely Hospital scandal. In 1981, the documentary Silent Minority exposed the inhumane treatment of people at long-stay hospitals, prompting the then government to, “move many of the residents into group homes”. Sound familiar? These are just two historic examples. If there is a tipping point, it is thanks to learning disabled campaigners, families, and a handful of supportive human rights lawyers, MPs and social care providers. Grassroots campaigns such as I Am Challenging Behaviour and Rightful Lives are among those shining a light on injustice. Care provider-led campaigns include Certitude’s Treat Me Right, Dimensions’ My GP and Me, Mencap’s Treat Me Well. Pause for a moment to acknowledge our modern world’s ageing population and rising life expectancy. Now consider the parallel universe of learning disabled people. Here, people get poorer care. Consequently, some die earlier than they should. And their preventable deaths aren’t properly investigated. 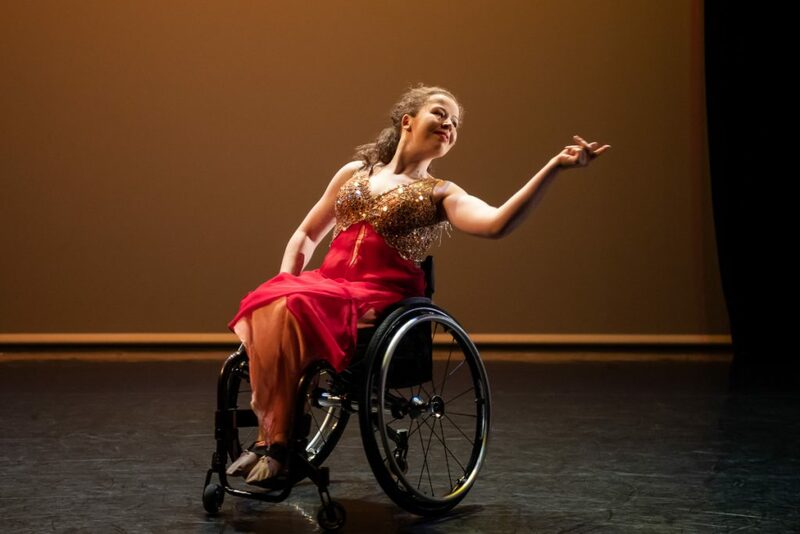 Isn’t it about time that learning disabled people enjoyed the same access to cultural lives and work as everyone else? This is one question that Venture Arts (VA) and our speakers will be asking the heritage and cultural sectors at our symposium, Making the Case, at the Grand Hall, Whitworth Art gallery on the 25th May. VA is an organisation that specialises in visual arts in the North West. “People with autism can do things like other people that don’t have autism in society. Society should be more accepting of people and not assume people can’t do things.” This is what Amber Opka Stother says – Amber (pictured above) chairs the VA steering group, has worked at Manchester Museum and arts centre HOME Manchester and is an ambassador for learning disabled people in the heritage and culture sector. 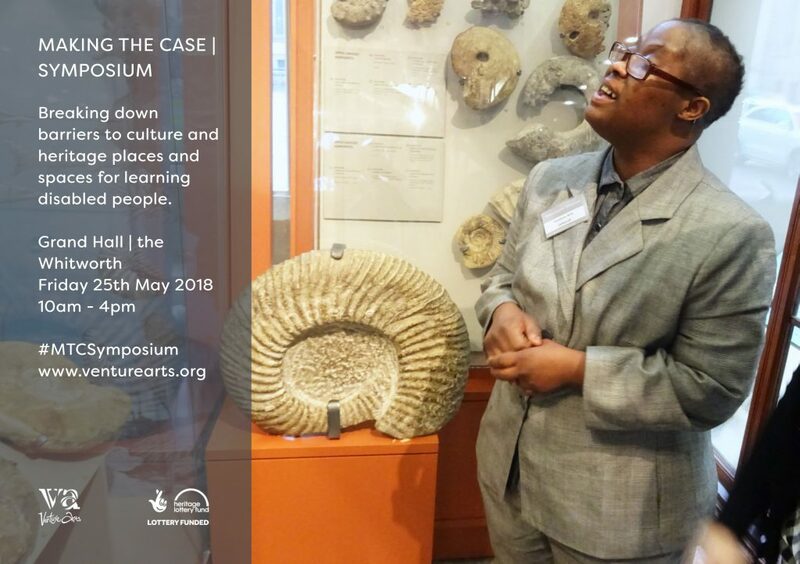 Our symposium will showcase the experiences of learning disabled people who have formed VA’s Cultural Enrichment Programme, funded through the Heritage Lottery Fund. The programme has seen over 20 people undertake 16 week work placements in some of Manchester’s best known cultural and heritage venues. On the day we will also be seeing and hearing about other projects from across the country and highlighting areas of best practice. “Unfortunately, our experience shows that people often don’t feel that big cultural institutions are for them or know how best to welcome people into their buildings. 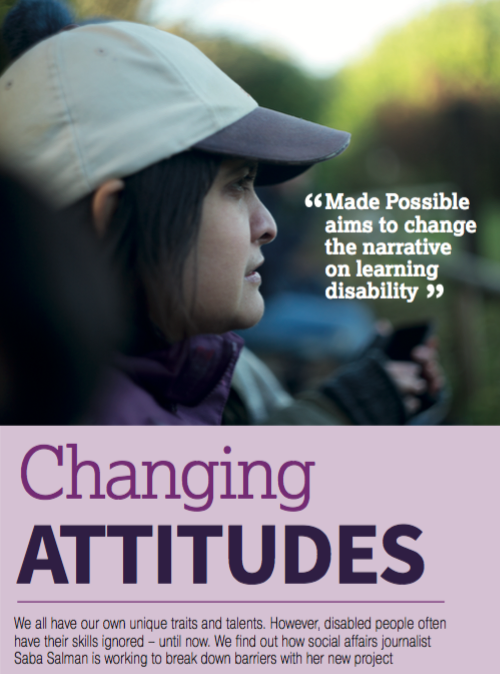 In my view we need to see more learning disabled people working within culture to be able to start to overcome this and make real change happen”, says Amanda Sutton, VA director. 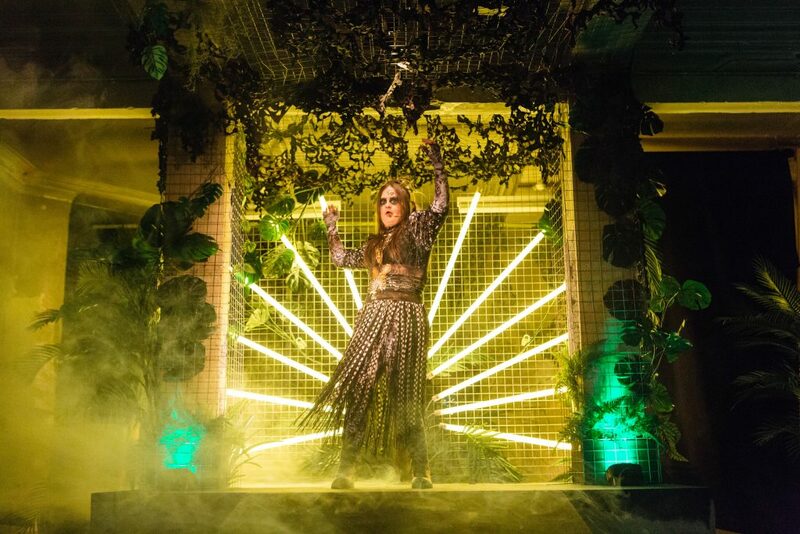 So Venture Arts aims to rectify this through working with cultural institutions to introduce learning disabled people to every aspect of their working operations. We reckon that if we can get people in “through the back door”, they will gradually change attitudes and integrate into institutions. Through our work so far, this has indeed happened. People have been back stage, in the conservation rooms, behind the scenes, delivering tours, in museum shops, in the staff room and are now well known by all the staff and visitors alike. At Manchester Museum, I volunteered and worked in the shop and in the postroom and in the vivarium as well. I ended up doing a tour for my friends and family which they really, really enjoyed, it boosted my confidence about speaking to people. It was really nice meeting lots of new people I did things that most people don’t . It’s nice to see the different parts of the museum. People were, very welcoming and I think I am helping them to learn more about working with people with autism too, maybe like how people communicate or something. Now I’ve started a new placement at HOME, an arts centre, which I’m really enjoying. We get to go behind the scenes and see how the cinema works which is really interesting and we have worked at the front of house and we get to see some free shows as well and that’s really, really good. I think it’s important to have people with autism working in these places to see what great skills people have and how it makes a difference to volunteering. They will be more interested in employing people with autism, it will make a big difference. On a personal level, it has helped me to be more confident and it’s helped me to become more confident in doing other jobs and things. I also work in a school and this experience has influenced how I am with the children, I feel more confident because I had to speak to people and that has lifted my confidence. 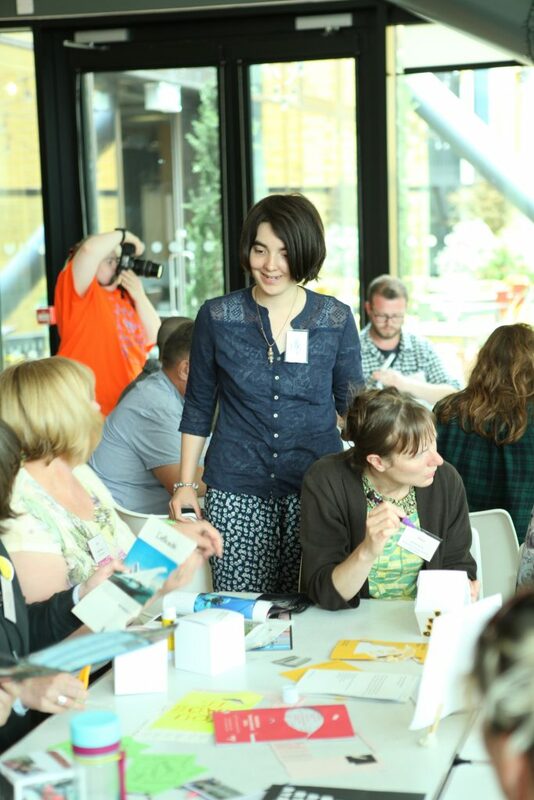 Last year I also delivered a workshop about making galleries accessible at a conference called Creative Minds and I loved every minute of it. 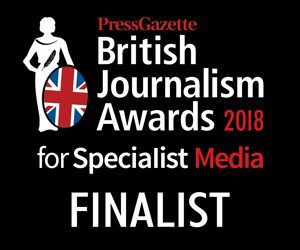 I probably wouldn’t have been able to do this if I hadn’t worked at the Manchester Museum beforehand. There were a lot of people there too so I was really happy with myself. I’m really looking forward to the symposium at the Whitworth as well and to interviewing people from museums and galleries. I’m going to interview them about the job and what we do. It will be really important to come to the symposium because you will get to hear about the great work that museums do with people with disabilities. Even though I’ve got autism I try and do things that people without autism think that people can’t do like drive, I’ve passed my driving test that was a big achievement for me because I’ve always loved cars. People with autism can do things like other people that don’t have autism in society. We need to celebrate difference and make sure that people recognise what great things people with disabilities can do. I get upset sometimes if people don’t understand me, like my driving instructor who didn’t think I could pass my test. It’s important to listen so people can know what message people are trying to get across. My advice for other museums? People have really great skills and they should give people the chance. People with disabilities can be really good at doing lots of great things and have skills that other people without a disability might not have, which can be valuable in a workplace. For example, people can be more understanding of other people. It would make me happy to see people with disabilities working in museums because it’s good to see people with great skills doing a good job. If people give them a chance it would be a great place to start when people don’t feel comfortable about going into a museum. Barriers for learning disabled people in going into a museum can be the staff of a museum because they might be a bit rude towards them or can’t understand if someone has no speech or something. It might not have a ramp or the lift might not be working or someone might be deaf as well so that could be a barrier. Museums should be more accessible to people with disabilities and people should make sure they don’t put jargon and put language that people understand on their walls. I’m looking forward to the 25th to hear about what people are going to say. I’m looking forward to meeting everyone and to what people have to say about their experiences at the museums and it should be a great day. Find out more about the Venture Arts symposium here or follow on Twitter, Instagram or Facebook. 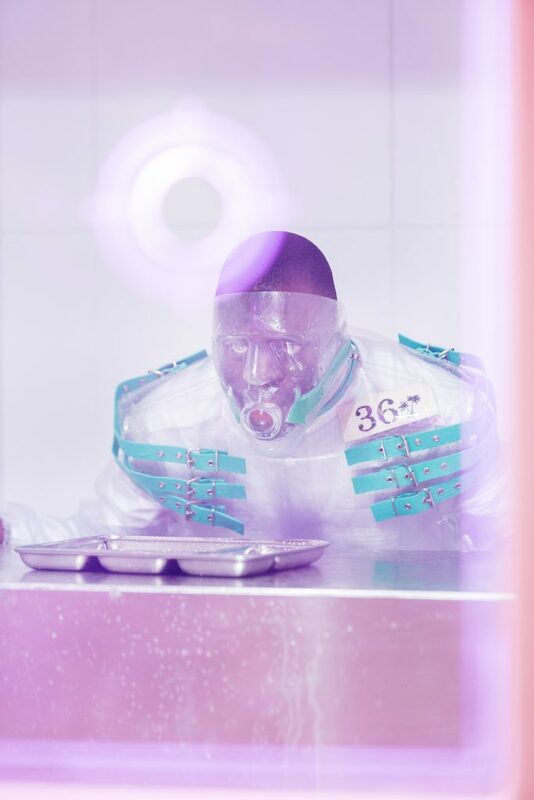 Venture Arts symposium is on Friday 25 May in Manchester. Everyone can dance, says Step Change Studios founder Rashmi Becker. 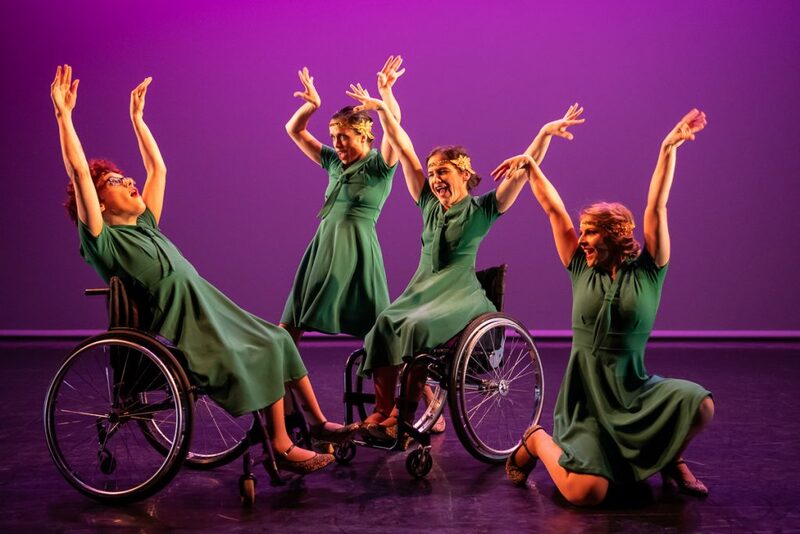 After seeing the dance company’s showcase at Sadlers Wells last night, I’d add that everyone should see its artists perform. 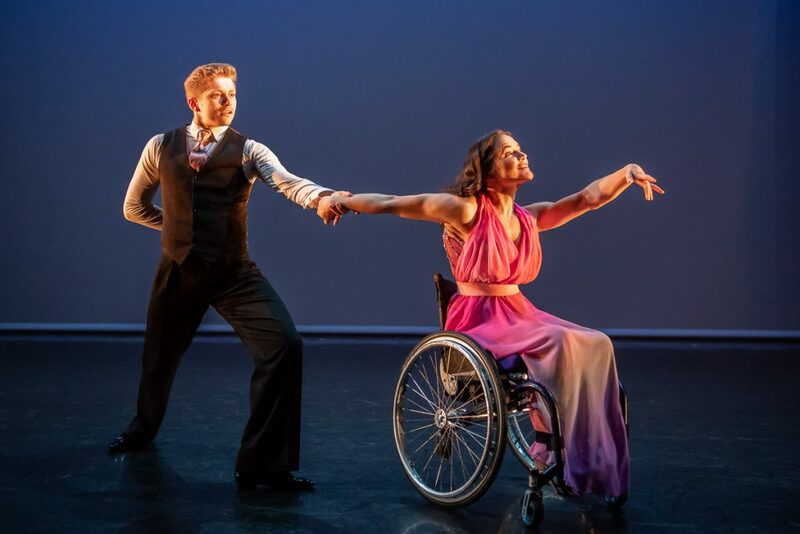 The one off event, called Fusion, was the UK’s first inclusive Latin and ballroom-inspired showcase, partly inspired by Rashmi’s experience of growing up with an autistic sibling. 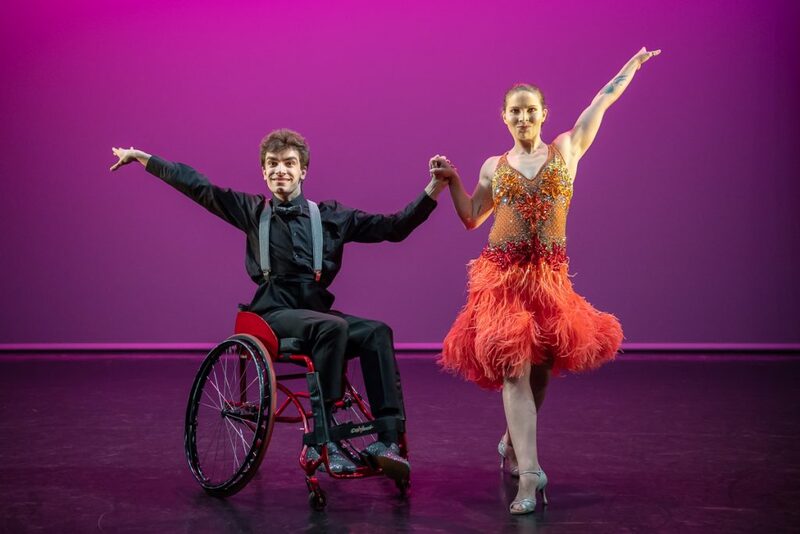 Supported by Sadler’s Wells, Arts Council England and the Dance Enterprise Ideas Fund, yesterday’s programme included a free wheelchair ballroom masterclass with world champion Pawel Karpinski. The post show discussion focused on the need for more genre-busting inclusive events like Fusion. 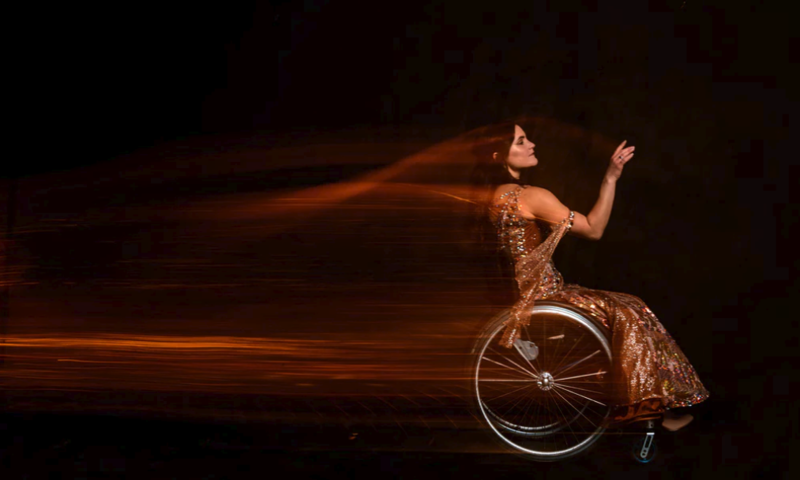 As well as “showing what’s possible”, as one audience member said, it challenges people’s perceptions of disability. But this wasn’t some worthy event with the creative bar suddenly lowered because its A Good Thing To Do. 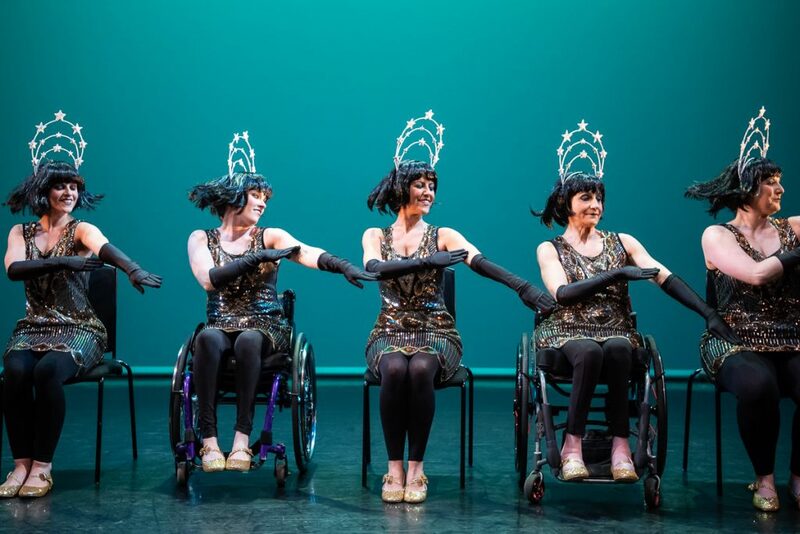 This was in turn innovative, expressive, playful, sassy, beautiful and infectious and a reminder of what can be achieved with ambition, forward-thinking arts programming and commissioning and reasonable adjustments (to method – not to quality). 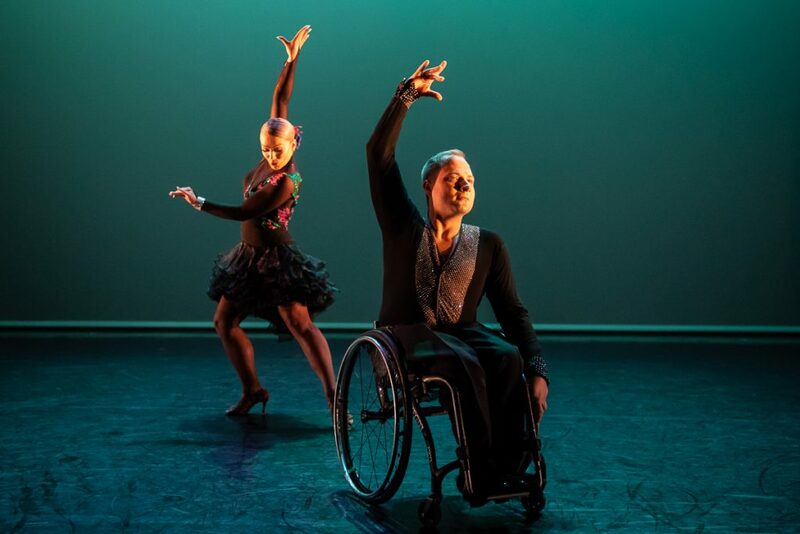 Launched in 2017, Step Change Studios enables disabled and non-disabled people to dance and in the last 12 months has held events for more than 900 disabled people including sessions in schools and arts venues. 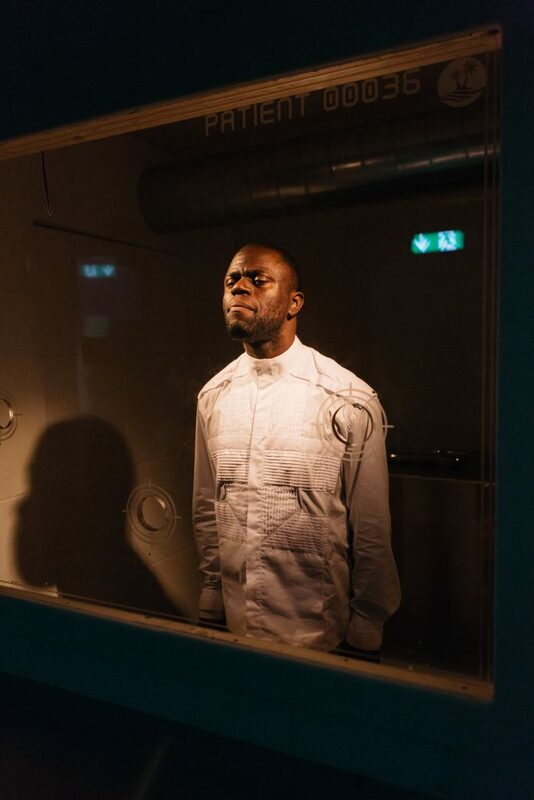 These are the words of Dayo Koleosho, an actor with the groundbreaking theatre company Access All Areas, describing what he hopes the public will gain from his new show, Madhouse re:exit. I’ve just written about the project for the Guardian. 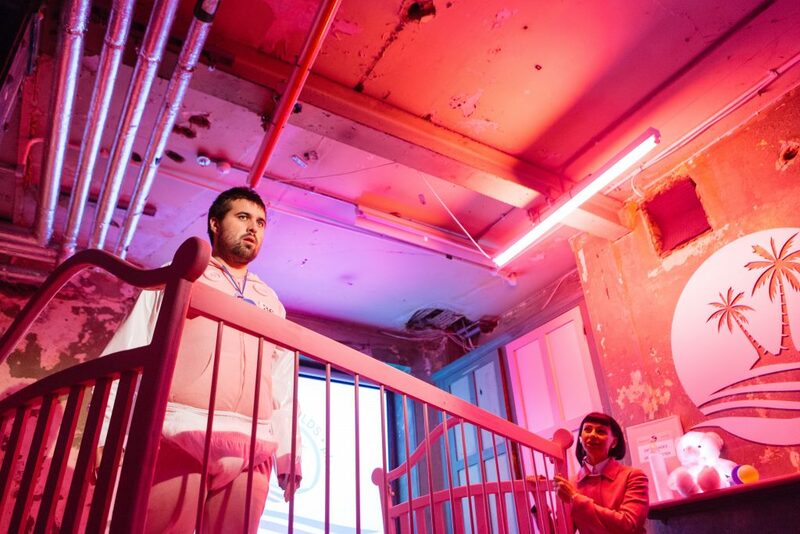 It’s a show that has been developed and performed by autistic and learning disabled artists and it highlights themes of institutionalisation and isolation, and explores the past, present and future of social care. 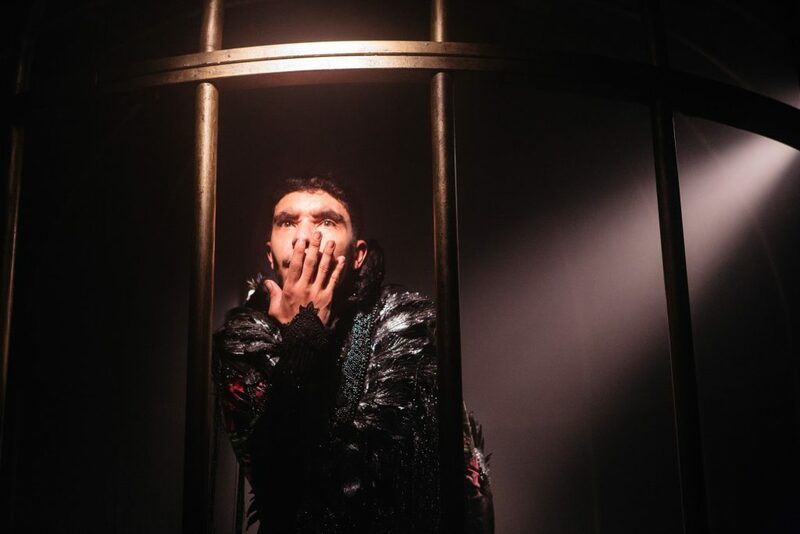 The show, which I caught during its London run, opens at the Lowry in Salford on 17 May as part of the Week 53 festival and follows more than two years of research and development. 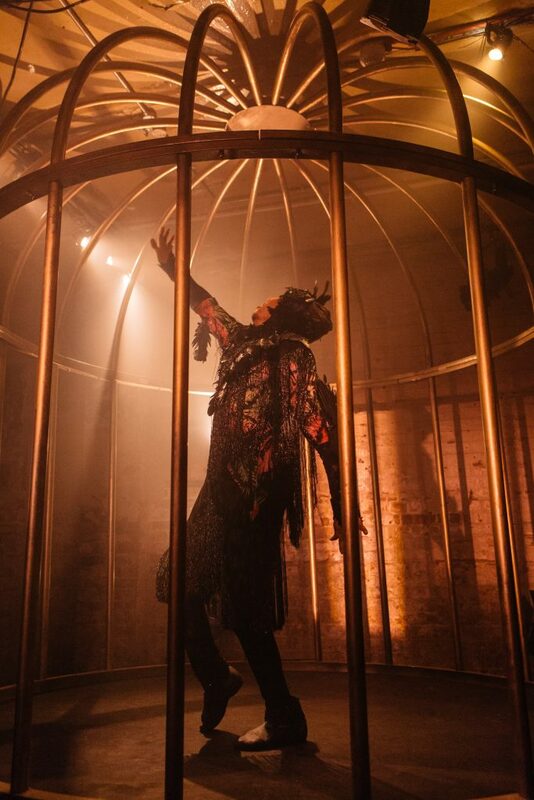 All the images here are shot by photographer Helen Murray, and you can read the entire piece about this superb show over on the Guardian website. The author with his daughter, Sarah (pic credit: Merriman family). Well, you could have knocked me over with a tea leaf. This was something. We always knew there was more that we could and should have done for our daughter 26 years ago when she was born with Down’s syndrome. Sarah does not suffer from Down’s syndrome. She has the genetic condition, which affects her life in many ways, but if anyone has met Sarah and other children and adults with Down’s syndrome, ‘suffering’ would not be the word that comes to mind. Sarah’s oft repeated phrase, ‘I love my life’ would easily dispel that myth. ‘Patients’? ‘Stigma’? People with Down’s syndrome are not ill and the only stigma that they might experience is the publication of such articles, which perpetuates the stereotypical view of my daughter and others. Increasing the awareness and understanding of Down’s syndrome and the opportunities for people with the condition will do much more to reduce any stigma. Sarah has facial features and physical characteristics that are more common in people with Down’s syndrome, but she looks more like us, her parents, than others with the condition. Her physiognomy remains unmistakably that of a young woman with Down’s syndrome and that’s who she is. Her Down’s syndrome is a part of her very being so we do not wish to take that away from her. We would only be changing the way she looks to make her features more acceptable to other people. In any case, her unique character is so prominent that her features become irrelevant. Of course, supplementing diets is not a new idea; over 20 years ago parents were experimenting with TNI (Targeted Nutritional Intervention) whereby supplements of vitamins, minerals, amino acids and digestive enzymes were given to children with Down’s syndrome. The programme was supposed to help cognitive development, clarity of speech and it was even claimed that there was an improvement of facial features. Even then, the term ‘improvement’ made me me somewhat nervous, as the term can only be subjective and dictated by society’s desire to make everyone appear ‘normal’. Are we now still are trying to eradicate the physical characteristics as a way of denying the diagnosis? Everybody has his or her own individual personality and physical make-up. People with Down’s syndrome are all unique individuals with their own personalities, family backgrounds and aspirations that make them who they are. Every individual person should be valued for who they are, not what they look like. Anyway, I had pondered too long over this preposterous article and so by now my coffee had gone cold. Maybe for my next beverage, I should forget the caffeine and imbibe some green tea. I had, after all, always wanted to look like George Clooney. Apparently, a nightly cup of Earl Grey can create a noble look, a steaming demitasse of Darjeeling before bed might turn me into a Kit Harrington doppelgänger and who knows the effect of a pint of Lapsang Souchong a day might achieve? No…on second thoughts I think I’ll stick to the java and remain just who I am. Andy Merriman is the Author of ‘A Major Adjustment, How a Remarkable Child Became a Remarkable Adult’, published by Safe Haven Books and available from the Down’s Syndrome Association and all bookshops. For Mario Christodoulou, buses are essential. “I use buses every day to get to work and to the shops – it is my only way of travelling,” he says. Christodoulou, from south-west London, is a peer advocate at learning disability charity Kingston Involve. As part of his work championing the rights of learning disabled people, he is involved in the Transport for London (TfL) Big Day Network, which holds learning disability awareness days in bus garages, bringing together learning disabled Londoners, their support staff, bus drivers and managers. 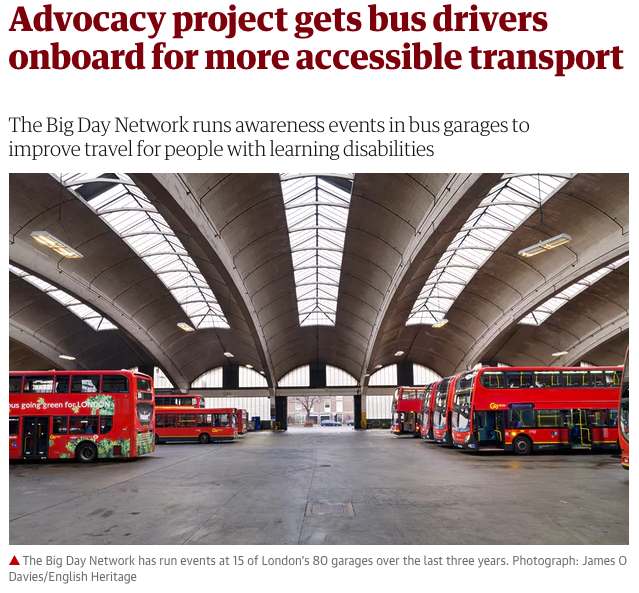 The network has 50 members from self-advocacy groups in London – 37 people with learning disabilities and 13 supporters – and has run events at 15 of the city’s 80 garages over the last three years in partnership with George Marcar, a TfL driver communications manager, surface transport. Discussions are held in a stationary bus, which helps people to visualise the issues raised. Areas of debate include confusing signage or drivers being unaware of so-called “invisible disabilities” – to find out more, read the rest of my article in the Guardian. Being able to do her own washing and having responsibility for her personal possessions symbolised the freedom Michelle Stevens* wanted but was denied in institutional care. Stevens features in my latest Guardian article (screenshot above). Her severe mental health problems meant she was in and out of residential care and mental health wards for a decade. She recalls staff shouting at her and living circumstances that were “very closed up and not nice at all”. Today, however, Stevens says she is “much happier and freer”. She has a bedroom in a large double-fronted Victorian house – and she loves the garden at her supported living home in West Norwood, south London, which is run by social care provider Certitude. “[It] is cleaner than other places I have been, and has nicer facilities,” says Stevens. She enjoys socialising – with the 11 other residents and locally – and for the first time in three years, she does her own washing and is trusted with her belongings. 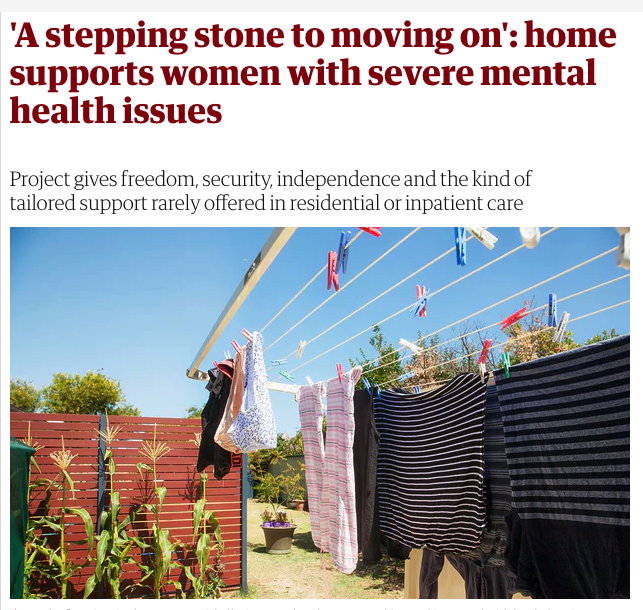 The women-only housing is designed for those with enduring and complex mental health issues who may be stuck in restrictive environments. Certitude provides support while First Priority, a housing association, manages the tenancy agreements. The home opened in September 2016 and residents, who are mostly in their 30s and 40s, benefit from individualised support that is rarely offered in residential or inpatient care. I’m really grateful to all the women who shared their experiences for the story and talked about the “good road ahead”, as Michelle put it, which now seems to be ahead of them. Read the rest of the article here. What would a truly accessible city look like? By 2050, an estimated 940 million disabled people will be living in cities, lending an urgency to the UN’s declaration that poor accessibility “presents a major challenge”. The Convention on the Rights of Persons with Disabilities and laws like the Americans with Disabilities Act, the UK’s Equality Act or Australia’s Disability Discrimination Act, aim to boost people’s rights and access. Yet the reality on the ground can be very different, as Guardian Cities readers recently reported when sharing their challenges in cities around the world. Barriers for physically disabled people range from blocked wheelchair ramps to buildings without lifts. The cluttered metropolitan environment, meanwhile, can be a sensory minefield for learning disabled or autistic people. Cities benefits from accessibility; one World Health Organisation study described how people are less likely to socialise or work without accessible transport. Cities also miss out on economic gains; in the UK the “purple pound” is worth £212bn , and the accessible tourism market for disabled visitors is worth £12bn. My Guardian report today looks at some of the most innovative city-based developments in the UK, Europe, Asia, America and Australia. These include skyscrapers built using universal design principles to the retrofitting of rails, ramps and lifts in transport services or digital trailblazers that help disabled people navigate their city. For example, mapping apps make navigating cities a doddle for most people – but their lack of detail on ramps and dropped kerbs mean they don’t always work well for people with a physical disability. The University of Washington’s Taskar Center for Accessible Technology has a solution: map-based app AccessMap, allowing pedestrians with limited mobility to plan accessible routes. 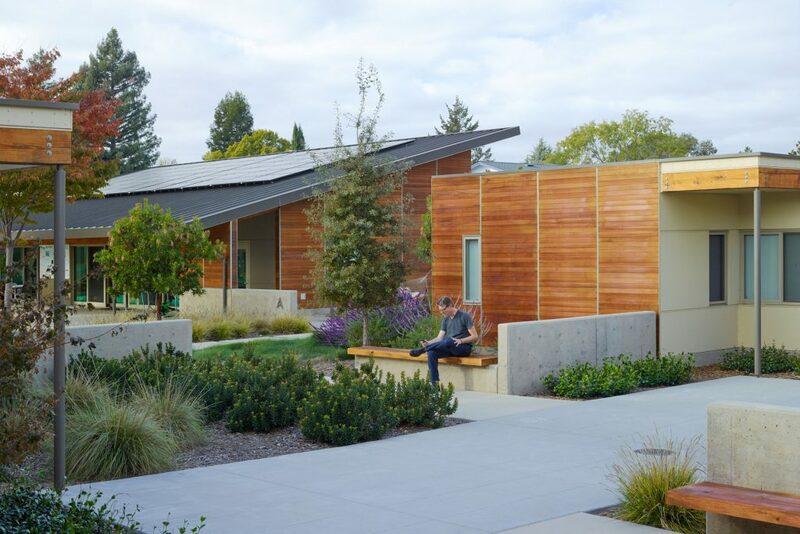 In another US-based project, this time in Sonoma, California, a $6.8m supported-housing project, Sweetwater Spectrum, is a pioneering example of autism-friendly design. Autistic people can be hypersensitive to sound, light and movement, and become overwhelmed by noisy, cluttered or crowded spaces. However, the scheme is designed according to autism-specific principles recommended by Arizona State University. The complex, which opened in 2013, includes four 4-bed homes for 16 young adults, a community centre, therapy pools and an urban farm – all designed by Leddy Maytum Stacy Architects. Noise is minimum thanks to quiet heating and ventilation systems and thoughtful design – like locating the laundry room away from the bedrooms. Fittings and décor reduce sensory stimulation and clutter, with muted colours, neutral tones and recessed or natural light used rather than bright lighting. Marsha Maytum, a founding principal at Leddy Maytum Stacy, says the design “integrates autism-specific design, universal design and sustainable design strategies to create an environment of calm and clarity that connects to nature and welcomes people of all abilities”. 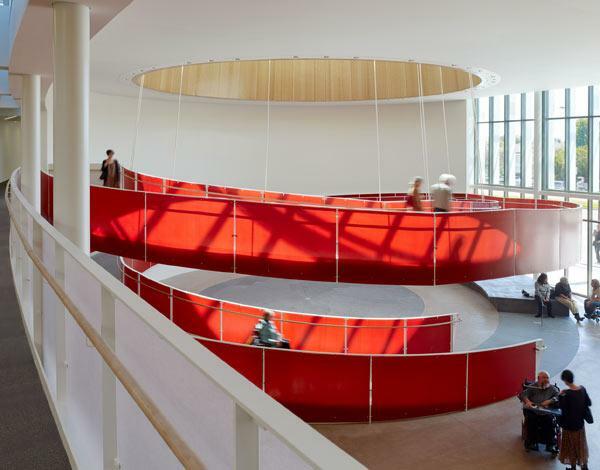 And there’s another great project from Leddy Maytum Stacy in nearby Berkeley, the Ed Roberts Campus, “a national and international model dedicated to disability rights and universal access”. The fully accessible building, named after the pioneering disability rights activist Ed Roberts, is home to seven disability charities, a conference, exhibition and fitness spaces, plus a creche and cafe. Features include a central ramp winding up to the second floor, wide corridors and hands–free sensors and timers to control lighting. No city is wholly accessible and inclusive, but there are groundbreaking examples leading the way – and we just need more of them. Read the full piece in the Guardian here. If you need social care support, why can’t services respond better to your individual aspirations – instead of fitting you into what’s already on offer? This aim – shifting traditional social work practice to “community led” methods – is at the heart of a new programme I’ve just reported on. Gail*, for example, has a learning difficulty, mobility problems and is prone to angry outbursts. Leeds council adult social care staff have supported her intermittently over a few years, helping with self-care and chaotic living conditions. Recently, it considered commissioning weekly visits from a support worker to help Gail manage her home. But instead, under a new approach launched in Leeds last year, Gail met social work staff at community “talking points” – venues such as libraries and churches instead of at home or at the council. The neutral environment sparked different conversations about support. Gail said she wanted to volunteer and staff felt able to be more creative with her care. A social worker supported Gail to explore opportunities at her community centre, where she began volunteering. Her self-esteem has grown, her personal appearance has improved and she has begun anger management classes. Feedback from people like Gail involved in the new support method includes comments about staff such as “they listened to me” and “we did talk about the important things”. 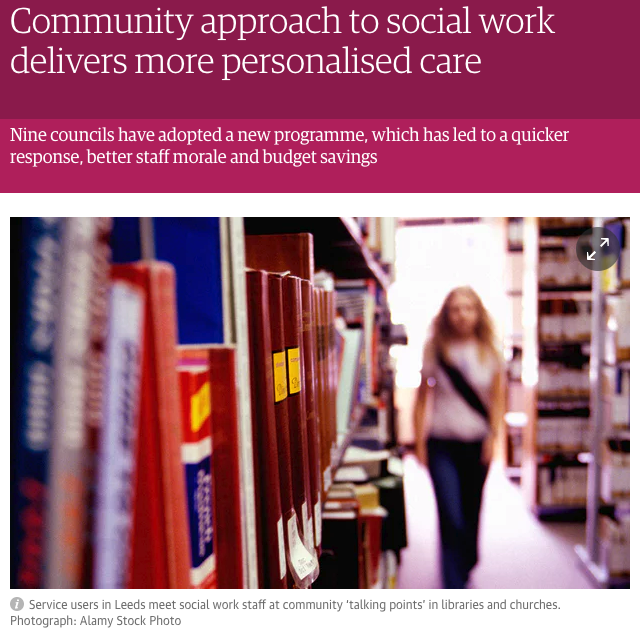 The concept of community social work is not new, but demand for social care, pressure on staff and funding cuts mean less time and freedom to develop innovative solutions. The 2014 Care Act encourages community-focused support, but this has been hard to achieve. A difficulty in developing “strengths-based” solutions is well documented, for example, in recent guidance from Think Local Act Personal.